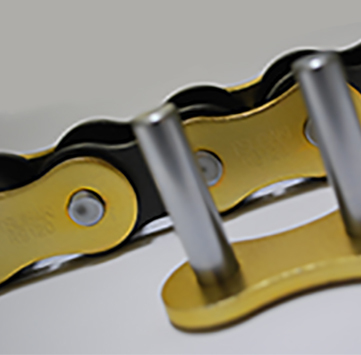 Titan chain incorporates the latest improvement from Tsubaki’s R&D to increase wear life of roller chains in harsh and high speed environments. Our Titan chain embodies the best features of our standard ASME/ANSI chain paired with the latest and unique features that will outperform competitors’ chains. Titan chain delivers the ultimate in strength and extended wear life. Titan provides a harder surface, lowering friction pin which limits the wear between the pin and bushing area. Titan chain has been tested against other manufacturer’s chain and the results are obvious, Titan chain extends wear life and outperforms the competition in similar environments. 3. Solid Lube Groove Bushing – Tsubaki’s patented PerforMaxTM bushings are cold formed from a solid piece of steel providing seamless construction. The solid construction and round shape means better surface between the pin and bushing while lube grooves on the inner surface of the bushing retain oil at the point of contact further increasing wear life. The Performax bushing is offered in sizes 80-140. 4. Ring Coined Connecting Links – Tsubaki’s patented ring-coining process increases fatigue strength and durability of the connecting links. The unique process causes positive compressive stresses around the pitch holes to counteract shock loads. This provides longer service life in your most demanding applications.